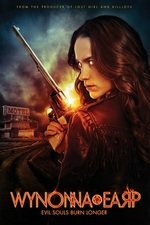 History keeps repeating itself when Wynonna has to make an impossible choice. Waverley and Nicole visit a jeweler, and a familiar face returns to Purgatory. Den of Geek review - Bulshar tortures Wynonna into giving him the key to Purgatory's Garden of Eden, while Waverly learns more about Bulshar's ring. Yay for the return of Mercedes - I'd hoped that them showing her in the hospital last season as having survived being de-faced meant they'd bring the character back, but wasn't really expecting it anymore considering how far into the season we've gotten. Yes! I'm so happy they've been bringing back some strong characters lately. I wish they'd done a little more with Constance, but it looks like we'll be getting more of Mercedes, which is definitely something I'm looking forward to. I really liked this episode, and the plot seems like it's picking up. Like the Den of Geek reviewer, I though the projection of Doc's face was both cheesy and very effective and affecting. It reminded me of back when I used to love Doctor Who, in the 20th century. They would have effects or costumes that you knew were made out of scraps on a budget but were also really cool or scary or whatever if you just let yourself get into it a little. It was also cool to learn that the actors were filming those scenes simultaneously and were miked to hear each other and it was kinda real time.